Think of a time in your life when you hit a wall. Everything was going to pieces. You were living your life and then wham. You got hit. And kept getting hit. One problem after another. It wasn’t, “Problems come in threes,” it was, “Problems come in SETS of three.” Been there? That’s where the protagonist of The Dog Year (Berkley Publishing Group) by Ann Garvin is. Dr. Lucy Peterman has worked hard her whole life to become who she is: a respected surgeon. It’s been work and work and more work to build the life she wants, but then it all falls apart. Tragedy strikes, her mind snaps, and she ends up in a 12 step program for stealing supplies from her hospital. But, you see, the old Lucy Peterman never would have stolen supplies. The old Lucy followed all the rules. She studied and went to med. school and won the white coat so she could care for other women. So why is she deliberately messing up her life so badly? What’s wrong with her? She doesn’t want to go to a 12 step program. That’s for other people; people with problems. People with issues. She doesn’t belong. But, she does. Dr. Lucy Peterman does need to be in the 12 step program. She has to dig herself out of the pit she has fallen into, as we all have to do at different times in our lives. That she completes the “pit digging” in AA, with a group of quirky/desperate/troubled people who have fallen into their own pits, and befriends a dog, makes this story all the more poignant and special. Sometimes the people who we need to turn us around are the people/animals we would least expect. And that’s why I loved The Dog Year. Because life is a mess and living through someone else’s mess, someone who is likable and relatable, like Lucy, makes you want to sit down with them and cry. And then maybe, together, you drink wine and laugh and watch a romance movie to escape from life. That Garvin created a character in Lucy that seems so very real, well, that’s a gift. Ann Garvin writes female characters we can believe in, cheer for and understand. Those characters are us, or parts of her characters are us, or they are our beloved sisters and that in-law we don’t like, and that aunt we admire for her eccentricities, and that wild best friend we still miss and that neighbor who was always so wry and cynical and sarcastic. She gets into the heart of a woman. She makes her come alive. 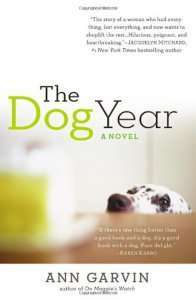 Definitely grab The Dog Year for the holidays. Ann Garvin is a nurse, professor, and a professional loser of keys. Dogs think she is amazing, and the feeling is mutual. Ann writes about women who have a good sense of humor about doing too much in a world that asks too much of them. She thought writing a book would get her a beach house. The beach house hasn’t happened yet, but she’s bought sunglasses, so she’s ready. She created Tall Poppies because she loves writers, readers, and helping women get their voices heard. Ann is the author of On Maggie’s Watch, The Dog Year, and the USA Today bestseller I Like You Just Fine When Your Not Around. You can buy/order Ann’s books from her local Madison independent bookseller Mystery to Me.